I have been interviewed by my friend and fellow Rowan Ambassador Cindi Brumpton of PurlOne! Cindi has been doing interviews of all the Rowan Ambassadors on her blog, and I think she’s done a marvellous job. Read all about how I became an ambassador and my love for little mushroom people here. 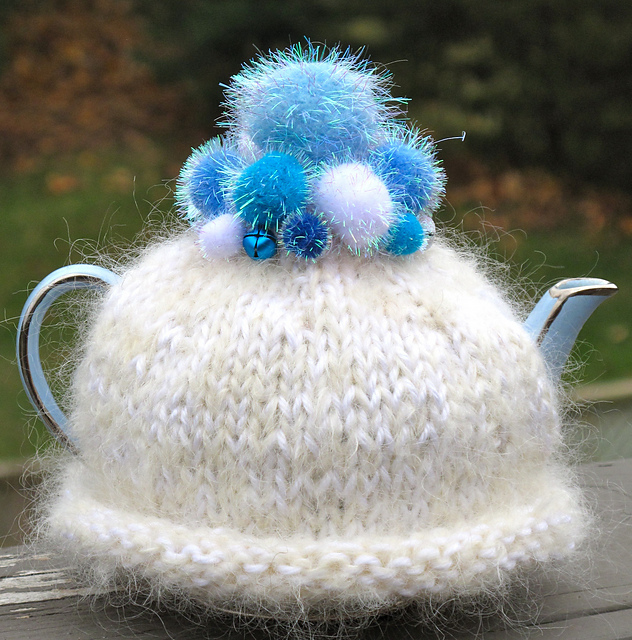 She’s a passionate writer and knitter herself, and I just wanted to show off her fabulous tea cozy design, Winter Wonderland, because IamSnowfox loves all things snow, and what could be better to keep you warm after a walk through the snowy winter world than a nice cup of tea? Oh, i just love that poofy thing! I know! So good on so many levels. Fuzz AND glitter AND bells. Brilliant.